But with education and the support of Visiting Nurse Association of Ohio, caregivers can take on that responsibility with confidence. For example, many caregivers are alarmed at the sight of blood and drainage in a wound. But, Cash said, blood is simply sign of good circulation. Redness around a wound may seem worrisome, but that is often an indication that the body’s immune system is doing its job, she said. Signs that should not be ignored include a foul-smelling odor or discharge that is thick and/or colored. Keep the patient hydrated by encouraging him to drink plenty of water. Add extra protein to the patient’s diet. These steps can improve healing. If the patient is diabetic, be sure her blood glucose stays in the target range. Uncontrolled diabetes slows the healing process. Try to keep anxiety levels low. Patients can pick up on their caregivers’ tension, and stress is known to inhibit healing. 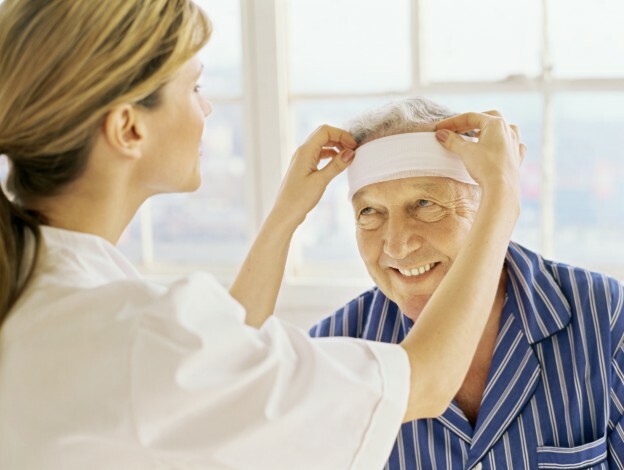 Ensure the patient’s clothing is loose-fitting over the wound and dressing. Remove all hand jewelry and wash hands thoroughly. Do this before handling the new dressing. Make sure to have all materials and supplies ready and staged on a clean work surface before removing the old dressing. Place a plastic bag nearby to discard used materials. Remove the tape from the old dressing. Using a medical glove, remove the old dressing and place it in the plastic bag. Wash hands again before touching the clean dressing materials. Gently clean the skin around the wound with a soft cloth or gauze pad soaked in saline or mild soapy water. Do NOT use skin cleansers, alcohol, peroxide or iodine as they can slow the healing process. If irrigating the wound is necessary, fill a syringe with saline or soapy water and hold it one to six inches away from the wound. Squeeze the fluid into the wound with enough force to wash out any debris. Dry the wound with a soft, clean cloth or piece of gauze using a gentle, patting motion. Apply the new dressing according to the physician’s instructions. Dispose of used wound dressing and other caregiving materials safely by “double bagging” them: Seal them up in a zipper-close storage bag or twist-tied bag, place that bag in a separate bag and seal it. Wash all laundry that may have been in contact with the wound or the old dressing separately from other laundry. Physicians advise patients and caregivers to be on the look out for fever and other signs that the wound has become infected. But, Cash said, VNA of Ohio’s homecare nurses conduct thorough wound assessments in order to catch any problems before an infection can take hold.